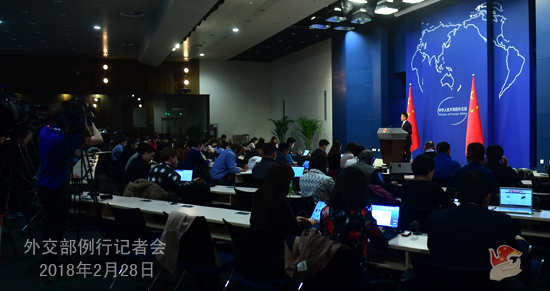 Q: We have learnt that the 23rd Meeting of the Joint Working Group (JWG) on the Implementation of the Declaration of Conduct of Parties in the South China Sea (DOC) will soon be held. Can you confirm that? A: As agreed, the 23rd China-ASEAN Joint Working Group (JWG) Meeting on the Implementation of the DOC will be held in Nha Trang, Viet Nam on March 1 and 2. This will be the first meeting of this mechanism to be held this year where various sides will have a full and in-depth exchange of views on implementing the DOC and advancing maritime practical cooperation and consultations on the Code of Conduct (COC) in the South China Sea. Thanks to the joint efforts of China and ASEAN countries, the current situation in the South China Sea has stablized and taken on a sound momentum. China and ASEAN countries have the willingness and confidence to build on such momentum of dialogue and cooperation to achieve more positive progress and results and further cement the sound situation in the region. Q: The ROK government today summoned the Chinese ambassador in Seoul to complain about a Chinese military aircraft flying into its Air Defense Identification Zone (ADIZ). Can you tell us what the ambassador's response was? A: China carried out flight training in relevant international airspace in complete conformity with international law and practices. I shall stress that the ADIZ is different from territorial airspace. The ROK's accusation against China on the basis of the so-called ADIZ is utterly unjustifiable. Q: According to Reuters, ROK President Moon Jae-in said that there is a need for the United States to lower the threshold for talks with the DPRK, and in response, the DPRK should show it is willing to denuclearise. It's important that the United States and the DPRK sit down together quickly. How do you comment on that? A: We believe that President Moon Jae-in's words merit all parties' careful thoughts. As we have stressed many times, the core of the Korean Peninsula nuclear issue is about security, the settlement of which hinges on the US and the DPRK. Thus, direct talks between the two parties are indispensable if the Korean Peninsula nuclear issue is to be resolved and a fundamental turnaround in the Korean Peninsula situation is to be achieved. You mentioned that President Moon Jae-in said that the US should lower the threshold for dialogue and the DPRK should show its will to denuclearise. 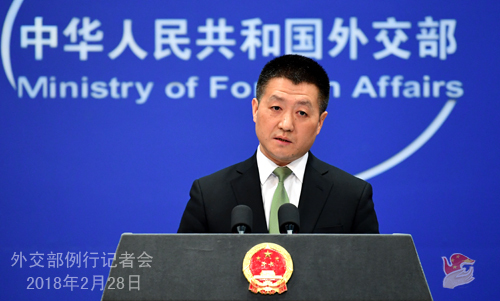 In fact, in order to move forward dialogues on this issue, China has proposed to launch bilateral and multilateral dialogues by lowering the threshold and taking synchronized and small steps. By "lowering the threshold" we mean no precondition that the other party finds difficult to accept shall be imposed. In particular, issues that need to be resolved in future talks shall not become preconditions for resuming talks, because after all, nothing will ever change if we don't start talking to one another. 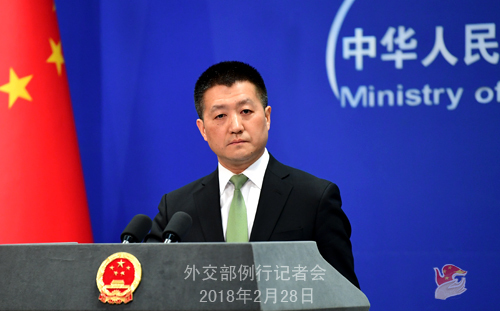 Regarding denuclearization, China's position is consistent and clear. A denuclearized Korean Peninsula serves the interests of all parties. That is also the firm position taken by China and other members of the international community. As we said before, there have been encouraging and positive signs unfolding on the Peninsula recently. We sincerely hope that with concerted efforts, the positive momentum of improved DPRK-ROK ties would be sustained and lead to direct dialogues between the DPRK and the US and then a comprehensive dialogue on fundamentally resolving the Korean Peninsula issue. Q: There have been reports from UN diplomats, citing a report of UN experts that the DPRK has been exporting materials to Syria that could be used in the manufacture of chemical weapons in 2016 and 2017. There are also other reports that these shipments were arranged by a Chinese trading company in Pyongyang. I wonder if China is investigating this incident? Is China concerned that the DPRK may be trying to continue to trade weapons illegally and is China actively trying to prevent this from happening? A: China is a party to the Chemical Weapons Convention (CWC) as well as a permanent member of the UN Security Council. Our position on the prohibition of chemical weapons is clear to all. China always maintains that Security Council resolutions must be implemented in a strict, comprehensive and accurate manner. As for the report you just cited, if Chinese entities or individuals did get involved in violation of relevant Security Council resolutions, China would surely handle it seriously as required by those resolutions and its domestic laws. But we also hope that relevant allegation should be based on solid factual evidence rather than hearsay. Q: According to reports, Malaysian Prime Minister Najib Razak recently spoke highly of the building of the Belt and Road, saying that Malaysia would benefit a lot from it. He said that Malaysia will continue to welcome Chinese investment, describing China's business community as one of the partners in building the high-income and high-skill Malaysia of the future and the country's cooperation with China has delivered win-win results. What's your comment? A: We spoke positively of the remarks by Prime Minister Najib Razak. Following the principle of extensive consultation, joint contribution and shared benefits, the Belt and Road Initiative aims for mutual benefit and win-win results. It has gained widespread support and active participation among the international community since it was proposed five years ago. As friendly neighbors, China and Malaysia have all along maintained close economic and trade cooperation. Malaysia is among the first to participate in the Belt and Road Initiative, and our joint efforts to build the Belt and Road have achieved tangible outcomes and delivered tangible benefits to the two peoples. We stand ready to continue to explore and carry out more mutually beneficial cooperation with Malaysia and other countries along the Belt and Road.